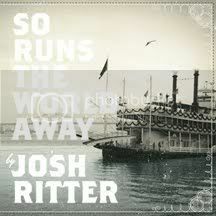 hearsoundswrite - A music blog out of South Carolina: Indie Music MAYhem Review 5: "So Runs the World Away"
Indie Music MAYhem Review 5: "So Runs the World Away"
I've long had a love/meh relationship with Josh Ritter, the grinning Idahoan renown for his ability to interweave ancient history and folk music in a rather unique way. Josh is both severely overrated and severely underrated. His fan-base trumps the guy up to Cohen/Dylan levels, and yet no one seems to notice him otherwise. He's apparently a joyful live performer, and therein lies much of his appeal, but since he never tours the South I can't attest to that. But at any rate, I don't love the guy's music, but he can write a fine song now and again. And The Animal Years is one of the better singer-songwriter albums from the last decade, I must begrudgingly admit. It was enough to warrant checking out his subsequent efforts, including his new one, So Runs the World Away. I must admit to being pleasantly surprised with the album. I can tell that special emphasis was put on instrumental texturing, as we hear distant guitar swells, lonely trumpet wails, arpeggiated piano chords washed in swirling tremolo. "Another New World", the near-eight minute epic about an explorer's passion for his ship, vis-a-vis a doomed Arctic expedition. The song perfectly illustrates the barren ice-scape on which we imagine the narrator is stranded; the instruments rise in and out of audibility like sinuous winds and waves, the fingerpicked guitar fluttering like a small, dim fire. Ritter's vocals are bold but timid, in the vein of Leonard Cohen...Christ, now I'm doing it! Ritter can certainly spin a yarn, and has the gift of injecting a humanizing element into a plot that might seem trite on its face. "The Curse", for instance, is the tale of an archaelogist who exhumes a mummy, who reanimates and falls in love with her while being taken to New York for display in a museum. He eventually enters society as a sort of celebrity. His aging rescuer travels with him until she dies. Sure, it sounds cheesy, but it's Ritter's ability to demand a willing suspension of disbelief through musical and lyrical grace that make the song work. I think Josh Ritter falls short when he's either trying to sound too intimidating or too cute. Take "Rattling Locks", an uncomfortably paced rocker for which Ritter's vocal delivery is serious and edgy. But he sounds less like a jaded sailor, and more like a high school sophomore playing a jaded sailor in the school play. On the other end of that spectrum lies "Lark", a blatant Paul Simon rip that'll dry up your testosterone, it's so gagworthy. Girls will like it, though. He's at his upbeat best when he's delivering grand and soaring anthems, like the excellent "Good Man" from The Animal Years. "Light in My Lantern" is a fine example of the former, a song I dare say sounds a bit like latter day Wilco, in both the arrangement and vocal delivery. I also dare to say that I prefer this approach from Ritter. (What can I say -- I like my Wilco contemplative and fractured.) Penultimate track "Orbital" is a bit of a whiff for me; it seems a little to restrained and polished for its own good, lacking the explosiveness it was trying for. "Long Shadows" takes that time-tested route of upbeat-acoustic-ditty-as-closer. We've seen it before from The Decemberists, Cass McCombs, Old Crow Medicine Show, and Bob Dylan to name a few. Hey, if it works it works. As an album, So Runs the World Away isn't quite as cohesively brilliant as The Animal Years, but song for song it could be Ritter's best effort. "Southern Pacifica", "Another New World", "The Curse", et al--these are well-written songs, both lyrically and musically. All to often for Ritter, it's one or the other. But with SRTWA, it's pretty satisfying to get the best of both worlds.